How do submissions and writing assignments work? Learn how you'll be posting your work in your class. Writing assignments are likely to be part of your Wet Ink experience. They are posted by your instructor for everyone in the class to complete. 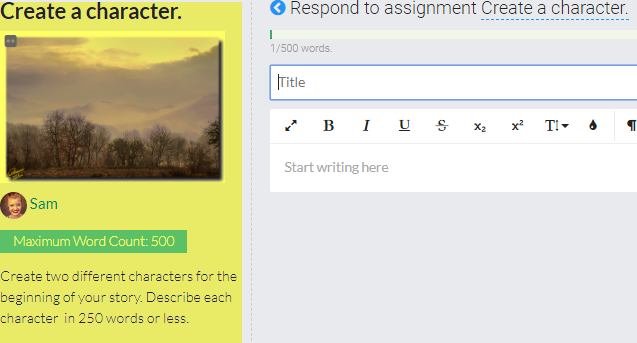 Writing Assignment: Request that you write something. You will likely be expected to provide feedback on your classmates' writing assignments, either through in-line comments, critiques, or discussions. Assignments can be required or optional. With Submissions, your instructor can create a schedule with staggered dates for single students to submit their writing. This is typically used in classes/workshops where students take turn posting their work in the class for others to critique on. What is in a writing assignment or a submission? Whether an assignment is optional or not. An annotation assignment is a little different. You will be taken to a screen that looks similar to viewing a classmate's completed assignment. There, you will be expected to use inline comments and highlighters to complete your assignment.